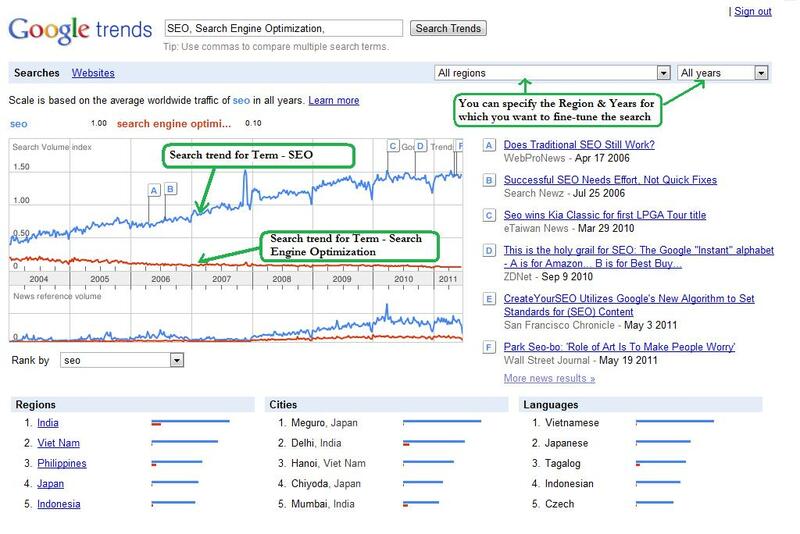 Most common myth is that Search Engine’s abhor SEO. However as we said already, this is a myth. Right from Google to Yahoo, all major Search Engine’s have always maintained that healthy SEO practices and using ‘White hat’ techniques are always welcomed by them. 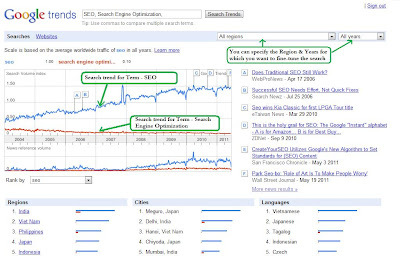 Google has gone ahead and provided various tools, which in right hands can make SEO much more in-depth and effective. Here’s a list of the tools we found to have maximum utility to anybody seeking to implement SEO for their website/blog. The God of all SEO tools, Google Webmaster is a boon from Google. Its comprehensive and highly in-depth. Once you master how to use it, its myriad functions can take your website/ blog from good to perfect in SEO terms. This tools helps in identifying numerous technical issues right from ‘broken links’ upto ‘reasons for your website’s slow speed’. Beware if you think of this as a mere technical tools, it’s a vast data mining resource center too. This tool can tell you what search queries lead to your pages, so you can fine-tune your keywords. 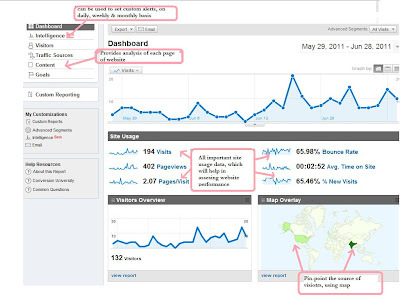 Google Analytics analysis your website/blog for you. It’s a very useful analytics tool. So long as you use ethical SEO techniques, you are absolutely going to love Google Analytics. I mention the ‘ethical’ part because Google Analytics brings your website, under Google scanner; and if you are up to any mischief then Google is quite likely to get hold of it and punish you appropriately. Google Analytics acts like your free Analyst; it tells you exactly what’s going on with your website. There is a whole gamut of information you can access ranging from ‘source of visitor’ to ‘bounce rates’. These data enable you to measure the performance of your website most accurately. 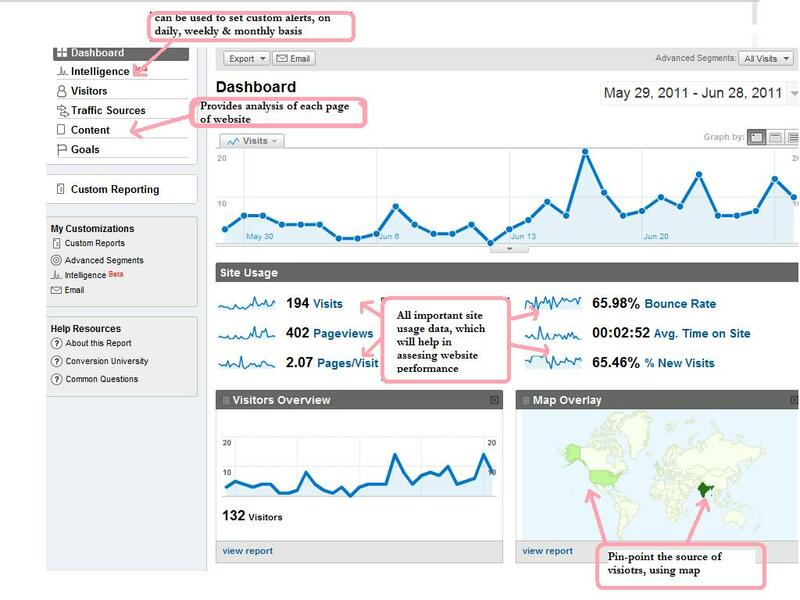 Here is a screenshot of Google Analytics Dashboard, which offers a host of features to perform in-depth analysis of your website/ blog. 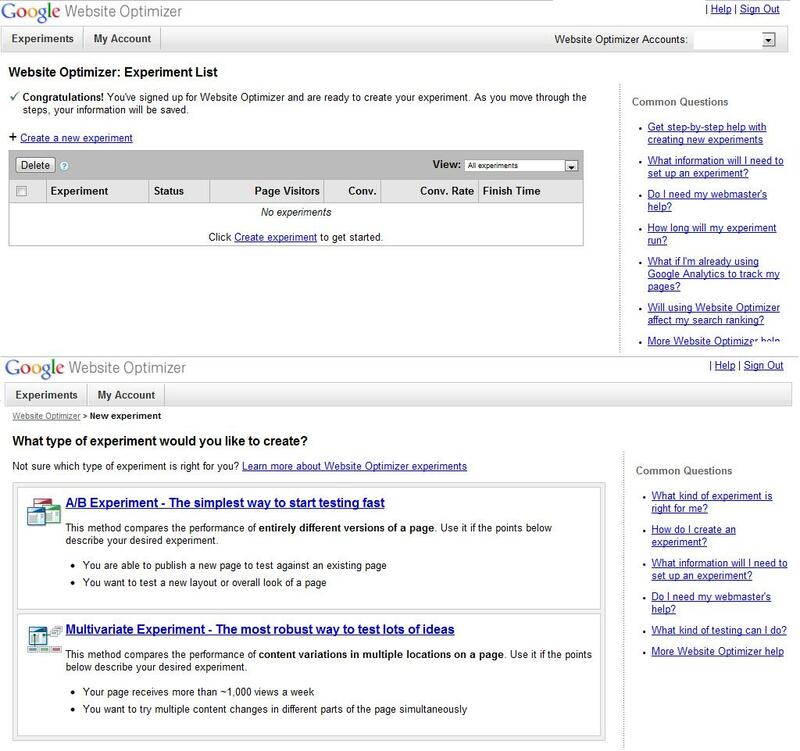 Google Website Optimizer name sys it all. This tool is what every website should be using. It allows for you to test different versions of your pages. Once you select the pages you want to work on. The optimizer will suggest various permutation & combination you can use to design those pages. Best is yet to come, the program tests your chosen combination against your real audience. The audience response is monitored to produce a wealth of data which is analysed and presented to you; to make informed decisions. This tool is a lifesaver, as it allows users to test various versions of their website, and then implement what audience likes most. Thus improving areas like sales, leads and decreasing the cost for the same. 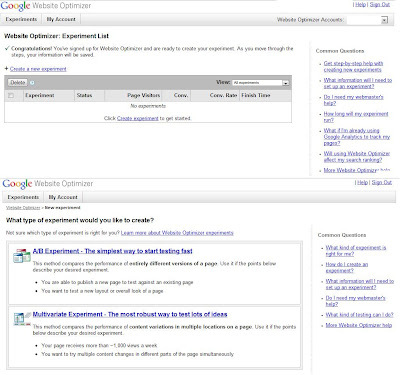 This is a screenshot of Google Website Optimizer. It works by treating each website for optimization as a experiment. When you click on ‘create a new experiment’ you are provided two options to choose from on which you want to base your experiment. 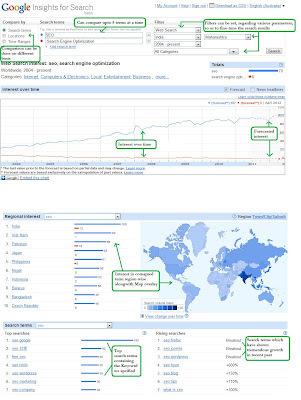 This tool is designed to allow comparative analysis of search terms. It allows you to enter single/ multiple keywords and then generates a chart showing their comparative popularity. This tool can also be used for comparing websites too. This tool helps you in determining the popularty trend of a keyword/website and if the trend follows a particular pattern, like cyclical/ weather based etc. For optimum results combine results from this tool, with its more advanced version Google insights. This will provide more detailed analysis. Here we have compared the Terms ‘SEO’ & ‘Search Engine Optimization’ to see their usage trend and comparatively decide which term is more popular and if any of them show some pattern in their trends. 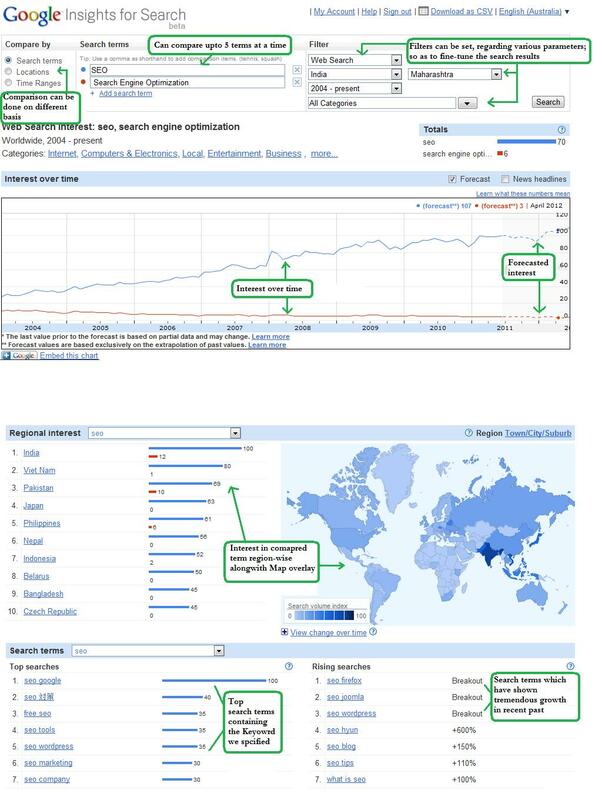 As we mentioned before, Google Insights is the advance version of Google Trends. This tool is slick and exhaustive. It allows for comparison by Keywords, Location & also Time range. This tool is meant for everybody, as its coverage is visrtually all inclusive. In case you are designing a marketing campaign, 1st use comparions by ‘Search terms’ and determine which keywords will offer you maximum audience. Next use comparison by ‘Location’ to find the location most suited to launch your campaign. And finally fine-tune your campaign by using compare by ‘Time ranges’ to determine the best time to launch your campign. And voila! You are all set. Did we mention the various filters you can use to tweak your search results!! They are like icing on the cake. This tool is perfect for bloggers too, as they can use it to gain insights into what are the topics catching public fantasy and cover the same in their blog. Here we have compared the Terms ‘SEO’ & ‘Search Engine Optimization’ to gain better insights on their usage as Search terms. Your very own mailman. Google alerts is a highly under-rated tool, its utility is best known to its users. This tool can be used to set-up alerts, for any topic/ word under the sun. It can even be filtered for sending only ‘news/ images/ real-time’ etc alerts. For companies this tool is the best invention, as it helps them in keeping a ear to the internet chatter, and monitor where all its name and brand is being mentioned and take action regarding the same if required. For bloggers, this tool can help them get an idea of the popular topics being discussed in their field, and the views and opinions floating about it. This will aid the blogger in writing more relevant and informed posts. A Screenshot of Google Alerts, which can be used to the optimum by setting various filters to fine-tune the alert results and its place of delivery too. All these tools are great; they do just what they are meant to do, help out the human working with them. But do not over-estimate the tools; they are as useful as you make them to be. The numbers generated by these tools are not always accurate and should be taken with requisite caution. This is a nice post, and the tools in this list are useful to me. and if you add http://siteexplorer.info to it, this will be more perfect, it is a totally free backlink checker, just try, and you will know why i said so.